It's not often that science confirms ideas straight out of vampire lore, but here you have one: a spate of studies in mice have found that infusions of young blood seem to reverse aging. So now we're moving to the next logical step: giving the blood of young humans to Alzheimer's patients. The first very human trials testing the effect of young blood will start in October at the Stanford School of Medicine. Patients with mild to moderate Alzheimer's will receive blood plasma donated by volunteers 30 or younger. Despite vampiric-sounding premise, approval for human trials were quite easy to get, the study's head Tony Wyss-Coray tells New Scientist. After all, we've been giving blood transfusions for long time—just without studying all the health effects. If the blood transfusion works as well in humans as it does in mice, brain function could improve immediately—but perhaps temporarily. 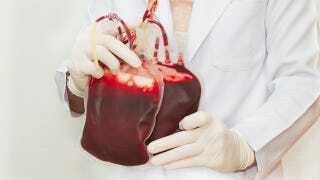 In mice, infusions of young blood also made their muscles heal faster and reverse the aging of their organs. The opposite happened when young mice were given old blood. "Blood might contain the fountain of youth after all," Wyss-Coray tells New Scientist. " And it is within us all – that's the crazy thing. It just loses its power as we age." While blood plasma transfusions are common already, even more handy would be identifying exactly what in young blood heals. Scientists have one idea: a protein called growth differentiation factor 11 (GDF11) that declines with age. Mice injected with GDF11 had brains with more blood new vessels and stem cells, both signs of a better functioning brain.